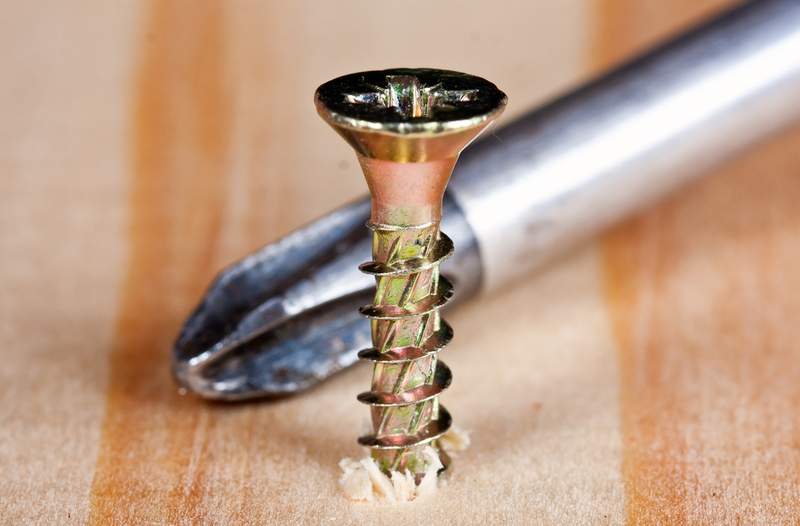 Why Do Screws Tighten Clockwise? Jim R. asks: Why is it “righty tighty, lefty loosey” with screws? One of the six simple machines, a screw is nothing more than an inclined plane wrapped around a center pole. While today screws come in standard sizes, and typically are tightened by turning clockwise (and loosened by turning counterclockwise), this is a recent invention. A great example of how things that seem simple can be really hard to do right, the development of the predicable system we enjoy today took 2,000 years to invent. Archytas of Tarentum (428 BC – 350 BC), a friend of Plato, is believed to have invented the screw around 400 BC, while Archimedes (287 BC – 212 BC) was one of the first to realize the screw’s ability to fix things together, as well as to lift water. The Romans developed hand-cut screws and made them with bronze and silver. Early on, screws of all sizes were used to press olive oil, help irrigate canals and drain bilges, and, of course, attach things together. Nonetheless, since these early screws were made by hand, threads were rarely precise and varied according to the preference of the craftsman. By the mid-16th century, Jaques Besson of the French court had invented a lathe that would cut a screw, although it took another 100 years for the process to take off. The modern lathe was later created by the Englishman Henry Maudsley in 1797, and with it, screw threads could be cut with great precision. Despite this, there was no uniform system for either screw sizes or threads. This was remedied by Maudsley’s apprentice, Joseph Whitworth (1803-1887), beginning in 1841 when he presented a paper advocating for a uniform system of screw threads to the Institute of Civil Engineers. His two-pronged suggestion was simple: (1) the angle of threads should be standardized at 55 degrees; and (2) the number of threads per inch should be standardized, although they would vary depending on the diameter of the screw. To alleviate some of the problems with manufacturing a British Standard Whitworth, American William Sellers in 1864 invented a thread that had flat roots and crests, a not insignificant modification as this screw could be made with “just one cutter and lathe.” Faster, easier and cheaper, the Sellers screw thread became popular in the United States and soon became standard among America’s railroads (two of which at this time were working on the transcontinental route). The British stuck with Whitworth’s slightly fussier screw, although the different standards posed few problems until World War II when British, Canadian and American troops co-mingled their equipment and repair parts. After the war, in 1949, Canada, the United States and the United Kingdom agreed to the Unified Thread Standard, based on the inch, with a 60-degree profile. Shortly after, the UK adopted the metric system and in 1960, its International System of Units (SI), as well as its ISO metric screw thread, also with a 60 degree profile. Globally, a right-turning metric screw is the standard, although in the U.S., about 60% of screw threads still follow the inch-based Unified Screw Thread System. Screw is a funny word. Since at least 1725 it has meant to copulate, and since 1900 it has meant to cheat or defraud. “To screw up” dates from 1942, while not having your head screwed on right has been an expression since at least 1821. The screwdriver cocktail traces its roots to 1956, and the screwball as a pitch to 1866, while as a person to 1933. The six great simple machines are the screw, the inclined plane, the lever, the pulley, the wedge and the wheel and axle. Mnemonics (devices to aid memory) date back to the 5th century BC and Simonides of Ceos, who developed the method of loci (locations), later used by Roman orators to remember long speeches. With loci, a series of locations are memorized, then an object is associated with part of the speech. Next a visual image is created with one of the objects in each location, and during the speech, the orator simply needs to visualize each location. Why are more people right-handed? What’s with the video announcements that I can’t mute or pause? Trying to read a semi-long form article with a add video playing way down the page doesn’t work well. @shane: There shouldn’t be any auto-play ads on this site. Some advertiser is misbehaving apparently. It was the ad right above the social media icons. Not only did it play 1 video, but kept playing different ads on a loop with no controls. @shane: Do you happen to remember what the ad was for? That helps track it down to remove it.